Following the administration of the oath of office to Councilmen Steve Detrick, Darren Suen, and Mayor Steve Ly, the Elk Grove City Council tackled a lengthy agenda at their last meeting of 2016 on Wednesday, December 14. One of the most anticipated item under consideration was how the Council should fill the vacancy for the District 4 seat, formerly occupied by Ly who vacated it upon his election as Mayor. During his presentation to the Council on their options, Elk Grove City Clerk Jason Lindgren noted the Council had established in their norms and procedures that their preference was to fill vacancies by appointment. Citing the high cost of conducting a special election, the Council decided to fill the vacancy by appointment. During public comment, three speakers urged the Council to not only conduct a special election noting that appointments fly in the face of the democratic process. Additionally, all three urged the Councilmen to change the election of council members to a by-district system from the current from-district method. One of those speakers was Terry Schanz, Chairperson of the Democratic Club of Sacramento County who not only said the City should hold a special election for this vacancy, it should convert to a by-district for of representation. Schanz also noted that several cities and school districts in the state were forced to change to by-district voting following litigation that from-district elections. 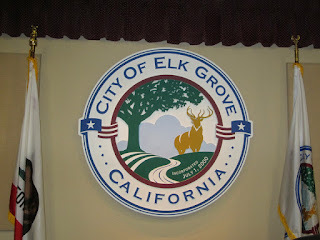 In Elk Grove's current system, Council Members live in a particular district but are elected by the entire city. A by-district system has representatives live in a district and are elected by only the voters in that district. "I think Elk Grove has an opportunity to show leadership, to show a progressive move, to allow, to empower voters to be participating in this local democracy through district elections," Schanz said. "I would encourage this council to take those steps." During their deliberations, Councilmen Detrick, Suen, and Pat Hume defended the continuation of the appointment process as citing it as a cost saving measure. Suen, who was appointed to the Council in 2014 to fill a vacancy on the District One seat upon Jim Cooper's election to the California State Assembly noted it is used at all levels of government, including the recent appointment of a new State Attorney General to replace Kamala Harris who was elected to the U.S. Senate. "If it is good enough for the Governor, it is good enough for me," he said. The Trio of Detrick, Hume and Suen also ferociously defended the maintenance of the from-district form of elections saying it ensures they are more responsive to the whole city rather than their respective districts. Hume praised the system and compared it to the Electoral College. "While it [the Electoral College] is not elegant, there is the genius behind it," Hume said. "It does not allow for a concentration of voters to determine the course of the entire county, much in the same way our system has been set, there is a lot of elegance to it." For his part, Ly unsuccessfully attempted to sway his colleagues to consider a special election to fill the District 4 seat. He also said the vacancy opportunity could provide an opportunity to examine a by-district system of representation in the special election. "Why couldn't we explore it," he said. "Would my colleagues be interested in bringing it back in early January." Hume responded saying he would not support Ly's suggestions noting "I think you are reverse engineering the democratic process." Hume added that he would be willing to have a discussion of by-district voting, but was unwilling to explore it in lieu of an appointment. "Why rush everything right now," Suen added. "I don't think we should try to rush anything." When Ly asked if there was any interest in considering an examination of the by-district system, Detrick immediately pushed back. "I personally don't have an interest," he said. Suen said he would be willing to have that discussion only after Elk Grove's population passed the 200,000 mark. "I'm fine with the way it is personally," Suen concluded.